Chris and Susie's New Christmas Song is now available in several formats. Please click on format below that suits your needs. *Don't forget to subscribe to their list above so they can keep you updated on the latest song additions, giveaways, and more! *Please feel free to join them on Facebook and Twitter (Links Above). *You can also check out the song on YouTube when it is released. 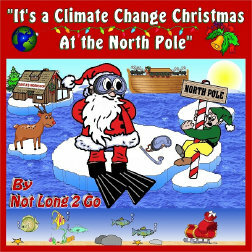 *Click Here for "Its a Climate Change Christmas at the North Pole" Song.